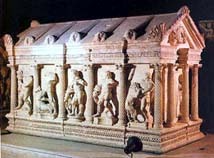 Antalya Archaeology Museum was awarded "Museum of the Year" in 1988 at a meeting in Delphi by the Council of Europe. It houses a wide-ranging collection of exhibits, from fossils dating back to Stone and Bronze ages to articles from the Helenistic-Roman-Byzantine periods. Some of the highlights of the museum are fine statues of Roman Emperors; Trajan, Hadrian and Septimus Severus and sarcophagi depicting the 12 labors of Hercules. Antalya Archaeology Museum also houses some of St. Nicholas's relics. He was the bishop of Myra, about 50 km west of Antalya. In addition, it contains a fine collection of mosaics, frescoes and Byzantine icons.